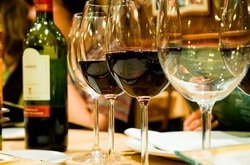 Botanical Gardens, Butterfly Conservatory, Wine Tasting, Lunch & 10-Course Banquet Dinner Included. Our trip includes visits to the Niagara Botanical Gardens & Butterfly Conservatory with a boxed picnic lunch, a stop at the Queenston Heights Lookout Point for some wonderful photo opportunities, a wine tasting experience at a winery in Niagara-On-The-Lake, time for you to explore the lovely and quaint town of Niagara-On-The-Lake itself and we finish off our day with a sumptuous 10-course dinner feast. We leave the Toronto area on Saturday morning at approximately 9:00 AM and return on Saturday night at approximately 9:00 PM. Actual pickup and drop-of times vary by pickup location. I hope you will join me on this wonderful day out and I look forward to seeing you on the bus. $120 per person. HST extra. 100% full refund if you cancel at least 7 days before the trip departure date. Sorry but no refunds if cancellation is received less then 7 days before trip departure date. Your seat is fully transferable to anyone else up to the time of departure without penalty. Round trip transportation on a deluxe highway motor coach. Admission to the Niagara Botanical Gardens included. Admission to the Niagara Butterfly Conservatory included. Boxed lunch at the Botanical Gardens. Vegetarian option available included. A stop at Queenston Heights Lookout Point for some photo opportunities included. Wine tasting of 4 wines at Pilliteri Estates Winery included. Free time to explore Niagara-On-The-Lake. 10-course deluxe dinner banquet included. Complimentary bottled water and snacks on the bus included. 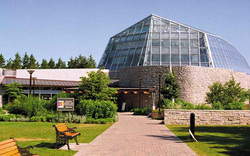 Niagara Parks' Botanical Gardens is located on the scenic Niagara Parkway and the Great Gorge. 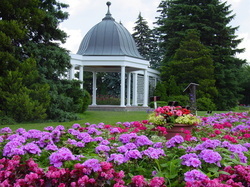 This beautiful garden setting is serves as the unique outdoor classroom for students attending the Niagara Parks School of Horticulture. Established in 1936, you'll enjoy 40 hectares (99 acres) of beautifully maintained gardens. Enjoy perennials, rhododendrons, azaleas, formal parterre garden, shade, herb and vegetable plantings, as well as the world-famous rose garden featuring over 2,400 roses. This magical attraction features over 2,000 colourful tropical butterflies floating freely among lush, exotic blossoms and greenery. Paths wind through the rainforest setting, past a pond and waterfall and the Emergence window, where butterflies leave their pupae and prepare to take their first flight! The self-guided walking tour of the Butterfly Conservatory begins with a short, informative video presentation that is close captioned for the hearing impaired. We will now visit Pilliteri Estates Winery, the world’s largest estate producer of Icewine and winner of 700+ awards for its wines. You will have an opportunity to taste 4 wines including their famous icewine. On our way back to Toronto we will stop for our dinner. It's a veritable feast consisting of a 10-course Italian banquet dinner. Our menu will consist of the following. Grilled chicken breast topped with zucchini, peppers and onions in a light citrus sauce. A vegetarian alternative of Zucchini parmagiana is available for this item. The cost of the meal, taxes and tips is included in the tour price. All beverages are extra and you will need to settle your bill for those directly with your server. We have 3 pickup locations for this tour. We leave the Toronto area on Saturday morning at approximately 9:00 AM. Actual pickup times vary by stop and will be sent out in the final email to all registered attendees, 2 days before the trip. We return to the Toronto area on Saturday night at approximately 9:00 PM. Sorry but this tour is restricted to adults 21+.